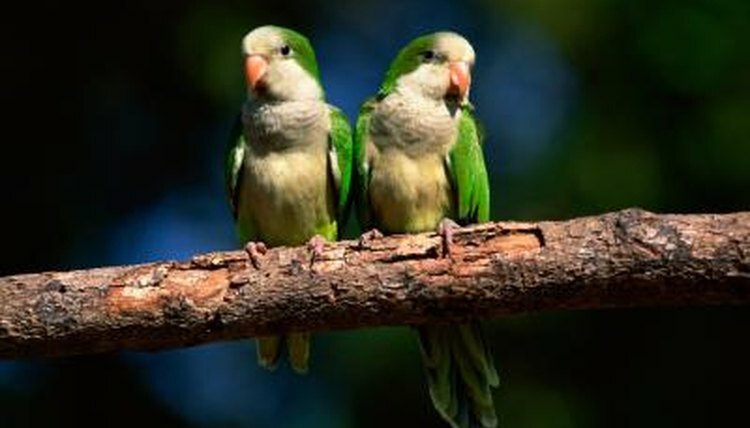 The Quaker parrot and the sun conure, also known as the monk parakeet and the sun parakeet, respectively, exist in the wild and in the pet trade. These parakeets live 25 to 30 years and grow to lengths of 29 to 30 centimeters. Quaker parrots and sun conures eat the same types of foods and come from analogous geographic locations. These two species differ greatly in appearance, though; and the Quaker parrot seems to be a bit hardier than the sun conure. Both the Quaker parrot and the sun conure originate from countries in South America. They reside in wooded and open country, often living in dry areas of scrub forest. Escaped Quaker parrots have learned to live wild in a variety of areas in North America and Europe, whereas the sun conure is considered endangered by the International Union for Conservation of Nature and Natural Resources. In captivity, both species require aviaries about 9 feet long. The basic colors of a Quaker parrot are gray and green. Quaker parrots have gray foreheads and pale gray cheeks, throats and abdomens. Feathers below the abdomen appear olive green and fade into yellow, while the head and back feather green. Sun conures have striking feathering of red, yellow and orange with slight green on the wings. They have black beaks, while Quaker parrots have pinkish-brown beaks. Both have bare white skin patches around the eyes. In captivity, Quaker parrots and sun conures eat similar diets. Both eat fruits, vegetables, greens, seeds, cheeses and commercial pellets. In the wild, Quaker parrots eat a wider variety of foods than sun conures, but both will eat fruits, berries, seeds, nuts and flowers. In addition to those foods, wild Quaker parrots will eat roots, cacti and insects. If fruit is abundant, more than 30 birds of either species may reside in a single flock. Quaker parrots are social creatures. They live in flocks and build their own community nests. Within each nest, a pair has two or more chambers. Quaker parrots in the wild live near humans and will mix with other birds at food sources. Behavioral information on wild sun conures is limited. Most information is based on captive birds. In captivity, sun conures seem to be very social birds, needing two hours of play time daily. Also, sun conures can become very loud when they are excited or ignored. Even though Quaker parrots originate from tropical regions, they have adapted to a variety of habitats. Their ability to adapt to different environments has allowed these birds to survive without the threat of endangerment. Sun conures, on the other hand, have become endangered. High demand in the pet trade has led to the exportation of thousands. The sun conure is scarce in its natural range. The current population is estimated at between 1,000 and 2,500 birds.